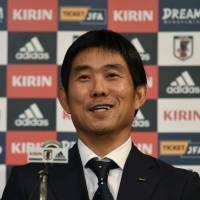 The Japan Football Association on Thursday asserted its days of reliance on foreign managers was over by naming Japan Olympic squad head coach Hajime Moriyasu to also manage the senior national team. The 49-year-old Moriyasu, who in October took over as head coach of the Japan men’s team for the 2020 Tokyo Olympics, fills the void left by Akira Nishino after the Samurai Blue’s round-of-16 defeat by Belgium in this summer’s World Cup finals in Russia. “To be the Olympic manager and then to take on this, is an impossibility for one person. 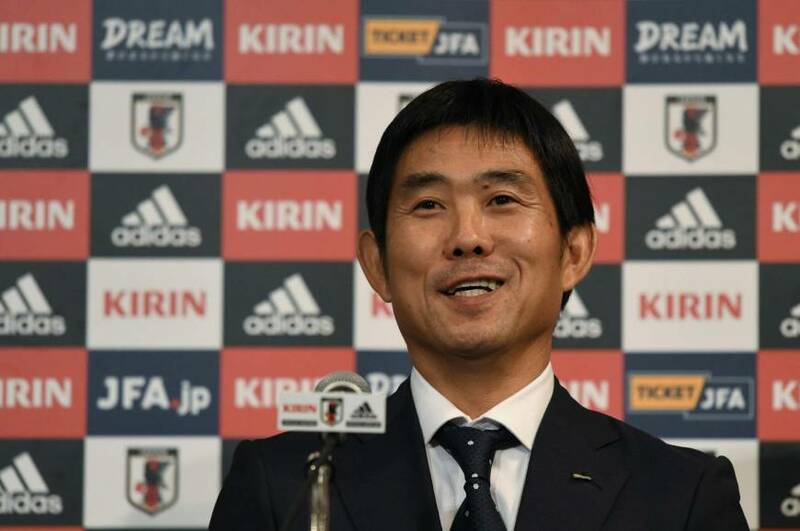 But with the support of the JFA and the many people of talent in Japan, what is impossible can be made possible,” Moriyasu told a news conference where he was introduced by JFA president Kozo Tashima and technical director Takashi Sekizuka. Since 1998, the JFA had turned to a foreigner to manage the national team at the start of every World Cup cycle. But in naming Moriyasu, Tashima and Sekizuka hammered on nationalistic talking points, the importance of doing things “the Japanese way” and capitalizing on Japanese qualities. Tashima and Sekizuka both commented on the importance of generational change and having a national team manager who could manage a seamless transition into the next World Cup cycle with many of the top team’s stalwarts getting on in years. “Being the Olympic manager is such a great honor and a heavy responsibility. Being in charge of the national team takes that from ‘heavy’ to ‘ultra-heavy,’ and I wondered if I was up to it,” Moriyasu said. Introduced as a man who had taught soccer at every level, from preschool to the highest professional level, Moriyasu took time to honor the people he said put Japanese soccer on the map. “Many people before me have passed this torch on to me,” he said. “I am here only because of the sacrifice of all those people with jobs and families who dedicate themselves to teaching the game in Japan. It is because of those countless people that we can see the superb players Japan has at its disposal. Moriyasu also paid tribute to Nishino, whom he coached for at this summer’s World Cup. Nishino took the reins following the shock dismissal of predecessor Vahid Halilhodzic in April, two months before the World Cup, and his brief run as Japan head coach ended in July when his contract expired. “The manager before Nishino, Halilhodzic, said Japanese players were lacking in certain areas,” Moriyasu said. “Nishino was superb. He made use of those things Japanese are good at as he studies ways to address deficiencies. In that way, he really built a team concept that was suited to Japanese. A member of the national team that missed out on a World Cup spot by drawing with Iraq in the qualification round in 1993, Moriyasu coached Sanfrecce Hiroshima to three J1 titles, in 2012, 2013 and 2015. Moriyasu is now on schedule to be the first national team head coach since Frenchman Philippe Troussier to lead Japan’s Olympic squad at the same time. Troussier led Japan at the 2000 Olympic Games and in 2002, where he became the first mentor to take Japan to the knockout phase at a World Cup.